Hyperinflation - What Does It Mean? What is the definition of "hyperinflation"? The definition of "hyperinflation" will vary depending on who you ask. According to Wikipedia, some people determine that hyperinflation occurs when you have a cumulative inflation rate of at least 100% over three years. Others will contend that true hyperinflation occurs when you have a dramatic monthly inflation rate, such as 50 to 100%. 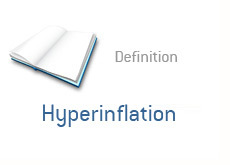 The simplest definition of hyperinflation? Rapidly increasing prices due to a plummeting currency. That loaf of bread that used to sell for $2.00? Suddenly it costs $4.00. That can of pop that used to cost $1.00? Now it sells for $5.00. A month later, it sells for $10.00. Three months later, it is selling for $30.00. When people think of "hyperinflation", they usually think of Hungary after WWII. Germany after WWI. Zimbabwe in present day. Those 100 trillion dollar Zimbabwe banknotes or million dollar Marks? A direct result of hyperinflation. Prices doubling every couple of days. People burning their money instead of spending it, because the logs in your fireplace have more value than the dollars in your hand. Ridiculously large banknotes as government frantically print dollars, therefore devaluing their currency even more. That's hyperinflation. Some people believe that hyperinflation may be coming to the United States. They cite some of the policies that the American government is currently undertaking to battle the current financial crisis. Namely, printing money. When you print money, this increases the money supply. Printing money results in inflation. Hyperinflation results in a cruel case of a government shooting itself in the foot. As inflation rises, a government prints more money. Printing more money results in greater inflation. Hyperinflation absolutely wrecks economies and destroys savings. Let's hope that hyperinflation doesn't rear its ugly head in the United States, or else we will all be in a lot of trouble. The Largest Single Holder of US Debt Is Now..